I lost a warner paddle on the Skycomish.. It should have my email on the blades (thad2000@aol.com).. It's strait shaft... black shaft, yellow fiberglass blades. Thanks. Today, awesome! Not that you lost the paddle, but that you got out! How was 10K on the lower? That's such a bummer- but given the levels that paddle is probably bobbing in salt water by now...But you never know. I lost a paddle on the Grand Canyon and it was found by a rafter six months later, stuck in debris in what he described as, "An eddy no one ever visits." Hope you get lucky. yea,.. I loaned my paddle out.. thought there would be three of us going down the river, but after the paddle was lost only two... and the other guy was really new in an inflatable. So I didn't screw around. 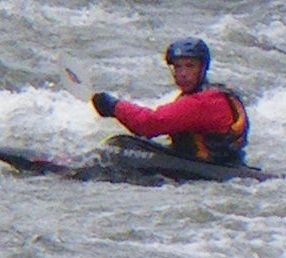 It's good to get out in bigger water when I've been keeping to low flows. I took the safest lines. I'd be for doing it again when I had more confidence in support. Then I could work on heavy current stuff. It's not bad, seems safe enough. The guy who lost the paddle was caught in a bad whole.. but flushed him after 3 roll attempts. Most of it was just strong moving with some nice wave trains and occasional side waves from the banks. Just remember a bit of respect.